Briefly describe your role and your program. "I have committed to a two year teaching position as a 7th and 8th grade Language Arts teacher in an urban, Catholic school in Brockton, MA through the Urban Catholic Teacher Corps. I will be serving urban students, living in an intentional community, and completing a master’s degree in Curriculum & Instruction at Boston College's Lynch School of Education." "When I was looking for a post-graduate program, I connected with SJU alumni who were education majors as undergraduate students to see what my options were. I heard about multiple programs through the University Consortium for Catholic Education that SJU alumni have participated in and I was instantly drawn to the mission of the Urban Catholic Teacher Corps program." 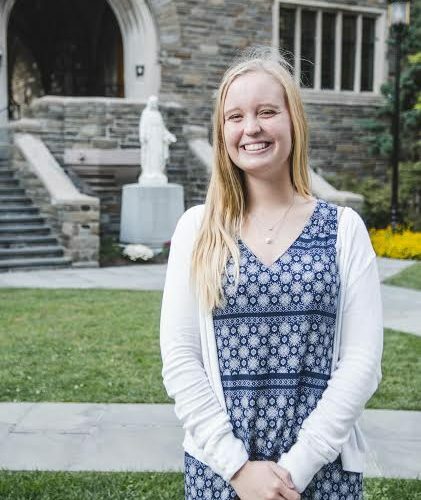 "My education classes at SJU introduced me to the idea of teaching for social justice through Jesuit ideals and values. I was always challenged and supported by my professors to think deeper about the issues in schools and how I can be an agent for change." "I participated in seven semesters of field work in various classrooms, including charter, public, and private schools. I also studied abroad in Galway, Ireland where I volunteered in a primary school once a week. Lastly, during my final semester at SJU I student taught in a 7th grade Language Arts classroom."